NOW WITH: Myristoyl pentapeptide-17, Copper Peptides, Biotin & More~! Buy it NOW for the cheapest price it will EVER be~! Not accepting any offers for the time being. This price is lower than ANY offer I've accepted. If you are listing a product using my name, no matter how BIG of a seller you are, STOP. There are Trademark issues here. And I will win. NOW WITH Biotin, Horsetail Extract & Copper Peptides~! The formula appears almost tan in color now~! I formulated this product after slipping with the hot wax and pulling off half my eyebrow! (I have plucked each individual hair ever since.) I was horrified, because your eyebrows really make or break your look. In acting, you learn that your eyebrows are KEY to conveying emotions (or not conveying). In modeling and makeup artistry, special attention is given to eyebrows to shape the face, emotion and theme of the show. If your eyebrows look good, you are more than half the way there! As we age, the brows do not grow in as full as they did in our youth. It is important to keep our brows conditioned and full if we wish to convey vitality to the world. This formula is an oily lotion that should be applied only where you want the hair to grow and in a very, very thin coating. It is normal to feel some tingling when it is applied and it may even itch a little. You are activating the hair follicles now! I realize it may not be the most comfortable thing to apply before sleeping, but your body is in "repair mode" while you sleep, so this is the best time to apply it. If you absolutely cannot do it at night, because you are worried about your pillowcase or are uncomfortable, try taking a nice break in the day or wearing it while you do housework. It may take more days to work that way, however. Results usually reported in 3-8 days, but can take up to 1 month or longer, stick with it and be patient. It DOES WORK for the majority of people~! We have many repeat customers for this product. Rapid Brow has even grown hair where none has grown before in some individuals~! It also has worked on facial hair for men - brows, too~! Can also use on edges~! Castor Oil, Black Castor Oil, Jojoba Oil, Vitamin E Oil, Polysorbate 80, Hydrolyzed Soy Protein, DMAE, MSM, Sodium Hyaluronate, Biotin, GHK Copper Peptides, Myristoyl pentapeptide-17, Allantoin, Aloe, Lemon Oil, Black Oil, Jujube Extract, Essential Oils, ROE, polyaminopropyl biguanide (paraben-free preservative) Proprietary formula. Patent Pending. Please shake before use. The color may not be bright white, but should be between clear and white. There may be "chunks" in the solution - it is Horse Chestnut and supposed to be there. This is an emulsion and it is prone to separation, simply shake it before use. If it will not mix properly, please use eBay messaging to contact me. 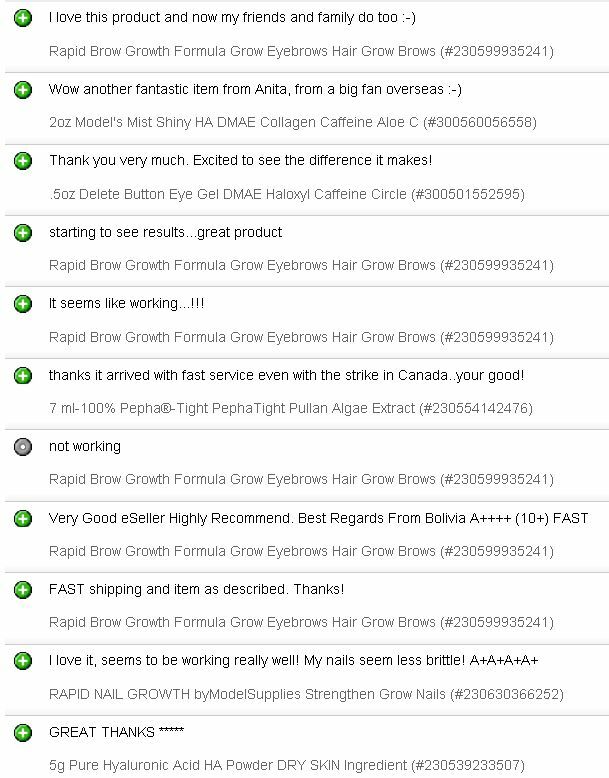 If you have been using Rapid Brow™ for 2 weeks and see no results, keep trying! Especially if you have never grown hair in that spot or using to thicken your brows. Those results can take up to 30 days, sometimes even beyond, but it does actually work! If for some reason it does not work for you, simply send back the bottle within the 30 day refund period and we will send you your money back~! 30 day bottom of the bottle guarantee~! Use "contact seller" for instructions. Thanks! Hope it works for you~!! We're Very Proud to Maintain 100% Positive Feedback! Please eBay message us first if you ever have any questions or problems!